Layer styles in Photoshop Elements range from simple shadow, glow, and bevel effects to more complex styles, such as buttons and patterns. The wonderful thing about layer styles is that they’re completely nondestructive. Unlike filters, layer styles don’t change your pixel data. You can edit them or even delete them if you’re unhappy with the results. Layer styles can be applied only to layers. If your image is just a background, convert it to a layer first. Layer styles are dynamically linked to the contents of a layer. If you move or edit the contents of the layer, the results are updated. When you apply a layer style to a layer, an fx symbol appears next to the layer’s name on the Layers panel. Double-click the fx to bring up the Style Settings dialog box and perform any editing that’s necessary to get the look you want. Layer styles are stored in a few different libraries. You can add shadows, glows, beveled and embossed edges, and more complex styles, such as neon, plastic, chrome, and various other image effects. A sampling of styles is shown in the following figure. Add dimension by applying shadows and bevels to your object or type. Select your desired image or type layer on the Layers panel. 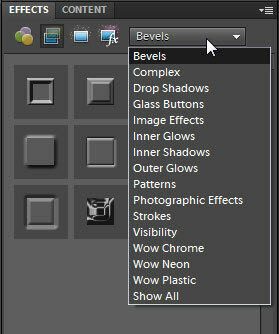 Select the Layer Styles button at the top of the Effects panel. Photoshop Elements provides many style libraries for Layer Styles. Bevels: Bevels add a three-dimensional edge on the outside or inside edges of the contents of a layer, giving the element some dimension. Emboss styles make elements appear as though they’re raised off or punched into the page. You can change the appearance of these styles, depending on the type of bevel chosen. Adjust parameters, such as the lighting angle, distance (how close the shadow is to the layer contents), size, bevel direction, and opacity. Drop and Inner Shadows: Add a soft drop or inner shadow to a layer. Choose from the garden-variety shadow or one that includes noise, neon, or outlines. You can adjust the lighting angle, distance, size, and opacity, as desired. Visibility: Click Show, Hide, or Ghosted to display, hide, or partially show the layer contents. The Layer Style remains fully displayed. Complex and others: The remaining layer styles are a cornucopia of different effects ranging from simple glass buttons to the more exotic effects, such as Groovy and Rose Impressions. You can customize all these layer styles to a certain extent by adjusting the various settings, which are similar to those for other styles in this list. On the Layer Styles panel, double-click your desired effect or drag the effect onto the image. The style, with its default settings, is applied to the layer. Note that layer styles are cumulative. You can apply multiple styles — specifically, one style from each library — to a single layer. To edit the style’s settings, either double-click the fx on the Layers panel or choose Layer→Layer Style→Style Settings. You can also apply layer styles to type layers, and the type layer doesn’t need to be simplified. Delete a layer style or styles. Choose Layer→Layer Style→Clear Layer Style or drag the fx icon on the Layers panel to the trash can icon. Copy and paste layer styles onto other layers. Select the layer containing the layer style and choose Layer→Layer Style→Copy Layer Style. Select the layer(s) on which you want to apply the effect and choose Layer→Layer Style→Paste Layer Style. If it’s easier, you can also just drag and drop an effect from one layer to another while holding down the Alt (Option on the Mac) key. Scale a layer style. Choose Layer→Layer Style→Scale Effects. Select Preview and enter a value between 1 and 1,000 percent. This action allows you to scale the style without scaling the element.